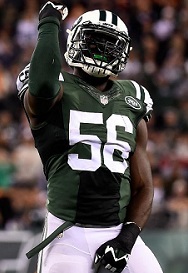 The Browns signed former New York Jets linebacker DeMario Davis today to a two-year deal worth about $8 million. This signing isn’t earth shattering but at least provides the Browns some depth at a unit that sorely needs it. Davis did say something to the media though that I didn’t quite understand. For a team that is so bad from upper management all the way down to player 53 he said there was a “lot of positive energy”. I don’t quite understand that, you’d think if that was the case they’d already have some good free agents locked in too deals. After he visited the team on Tuesday in Berea, free agent linebacker DeMario Davis has signed a contract with the Browns and is very excited to join his new team. “There’s a lot of positive energy in this building,” Davis said. “It seems like they’re ready to take this organization in the right direction. I felt nothing but positive vibes from (executive vice president of football operations Sashi Brown) all the way down to the defensive coordinator and the head coach. I just felt like this was the best fit for me and my family. I wanted to be a part of what was going on here so I’m happy to be a part of it. As for what he feels he can bring to the Browns, Davis wants to bring a versatility to the linebacker position and to be a positive influence on a suddenly brand-new unit. DeMario has started every game for the Jets over the past three seasons. During that time he’s sacked the quarterback six and a half times while averaging 104 tackle per season. His weakness comes in pass coverage though but even then he’s still been serviceable. Davis will able to fill help fill the inside linebacker position that opened up after the release of Karlos Dansby. He’ll be an even bigger help to the unit when the Browns let Craig Robertson sign elsewhere. While Davis has never graded out more than an average linebacker, you have to give the Browns somewhat of a passing grade here. Even an average player is better than the dumpster fire that their roster was last season.